Embody the laid-back luxe of LA style with Velvet founded in 1997 by Jenny Graham and Toni Spencer, Velvet by Graham & Spencer is known for its elevated basics. The range offers a wide range of chic, casual pieces we love Velvet for their elevated staples and quality fabrics, finish and design. These contemporary pieces are made for summer especially the loose easy fitting tops which will work with your denim or over your beachwear. Crafted from a lightweight rayon challis, Velvet's Olga top is a chic wardrobe necessity. Featuring a slightly gathered seam at the back of the neck, which lends the top a floaty and relaxed feel, the Olga has a split v-neckline with tie detailing and short sleeves. 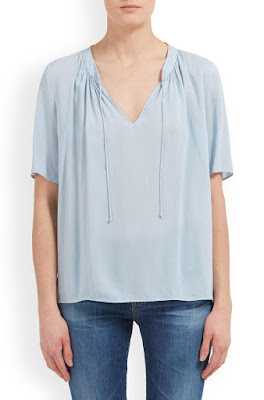 Layer under your favourite Helene Berman blazer or dress down with cropped denim, however you choose to wear this top you'll find it a throw-on-and-go staple. We love the Hayes top in white by Velvet for an everyday essential. 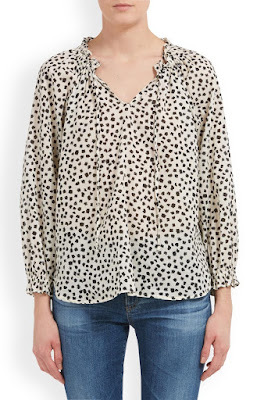 The body of this button-up blouse is crafted from our super soft cotton slub fabric, while the sleeves get the casual luxe treatment when crafted from a sheer cotton gauze. With an elastic cinch cuff and slightly scooped hemline, this is the easy addition your closet needs - whatever the season. 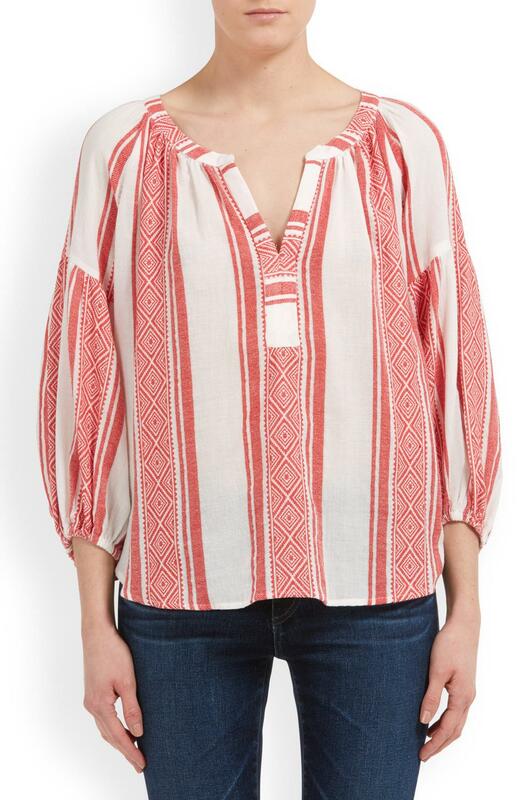 Crafted from a soft red and ecru jacquard cotton, the Britt Island top by Velvet is top of our summer wish list. 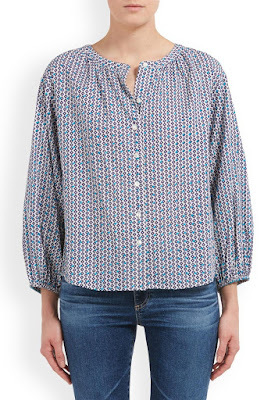 The perfect vacation style, this blouse has a drop shoulder seam, puffed three-quarter elasticated sleeves and a relaxed silhouette which finishes just below the hips and is slightly longer at the back. Finished with a reinforced placket, the woven pattern feels Latin American inspired and totally effortless. Pair with everything from shorts to white jeans and sandals. 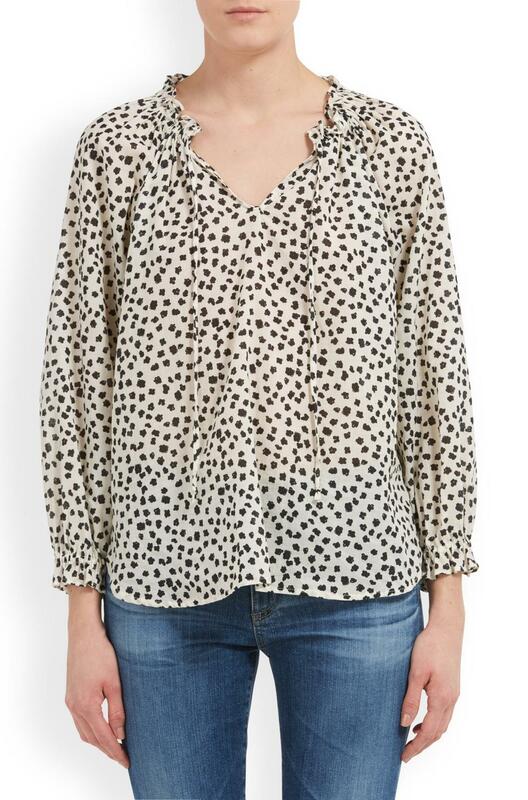 Another perfect peasant blouse from Velvet, the Freya top comes in the black and white calla dot print for spring. A work-to-weekend style that looks as good tucked into your favourite jeans as with smart trousers, this soft weave top has long sleeves and a straight, relaxed fit. 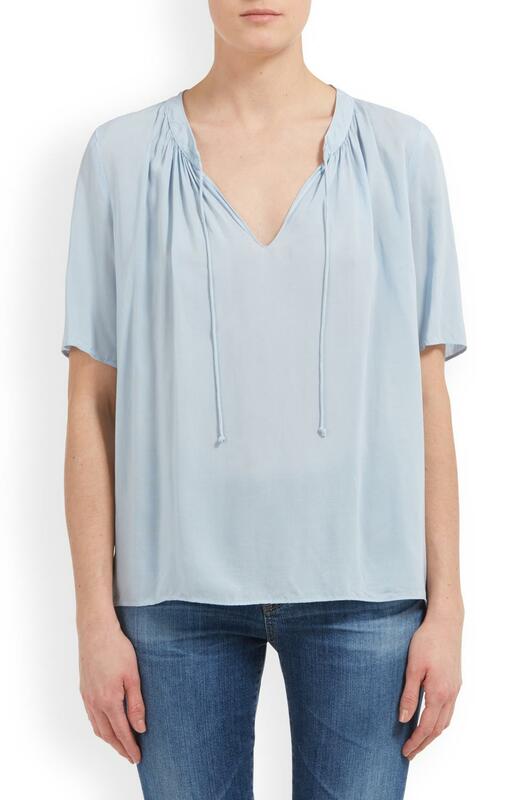 Finished with a tie detail at the split v-neckline, we think the Freya top is a wardrobe staple. A charming blouse for spring, Velvet's Sandrine top comes in a light pink floral print. A work-to-weekend style that looks as good tucked into your favourite jeans as with smart trousers, this soft weave top has three quarter length sleeves with drop shoulders and elasticated sleeves. Finished with a double tie detail at the split v-neckline, we think the Sandrine is perfectly on trend for the SS18 season. 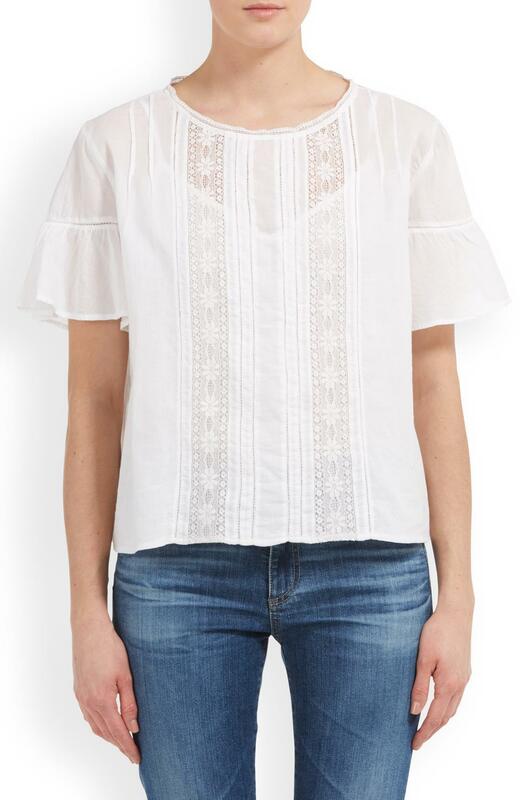 Velvet's Sheri top is a chic wardrobe necessity for summer in white lace and cotton. Featuring a round neckline and short flutter sleeves, the Sheri has a straight fit and keyhole button fastening at the back. 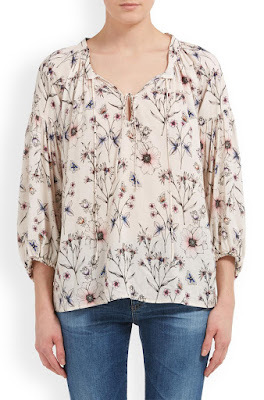 Layer under your favourite Helene Berman blazer or dress down with cropped denim, however you choose to wear this top you'll find it a throw-on-and-go staple. Velvet's Rina top is a fun and fashionable summer style with a kaftan silhouette. With a split v-neckline and tassel tie detail, we think the Rina is a great vacation buy as well as perfect for the city when styled with vintage washes in denim. 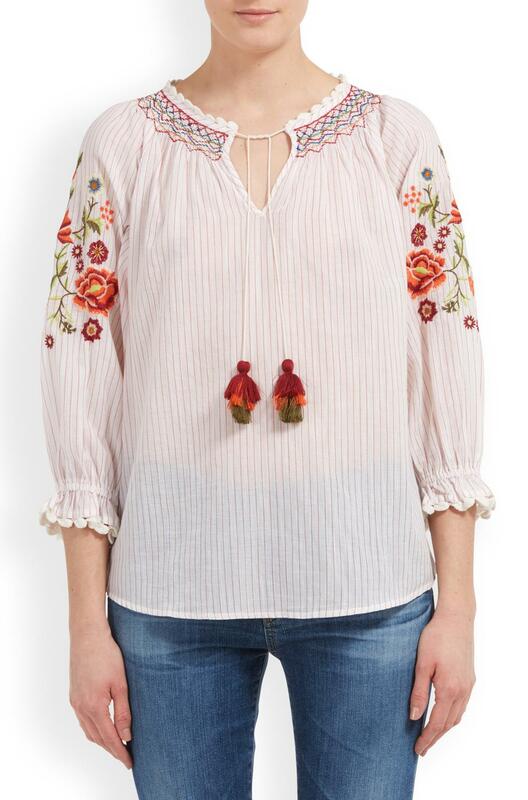 With a white background and subtle orange stripe running throughout, this peasant style blouse is finished with embroidery along the neckline and sleeves and ruffled arm openings with a scallop trim. A fresh print you’ll want to add to your wardrobe, Velvet's Oprah top comes in an all-over lattice print which is dotted with beadwork. 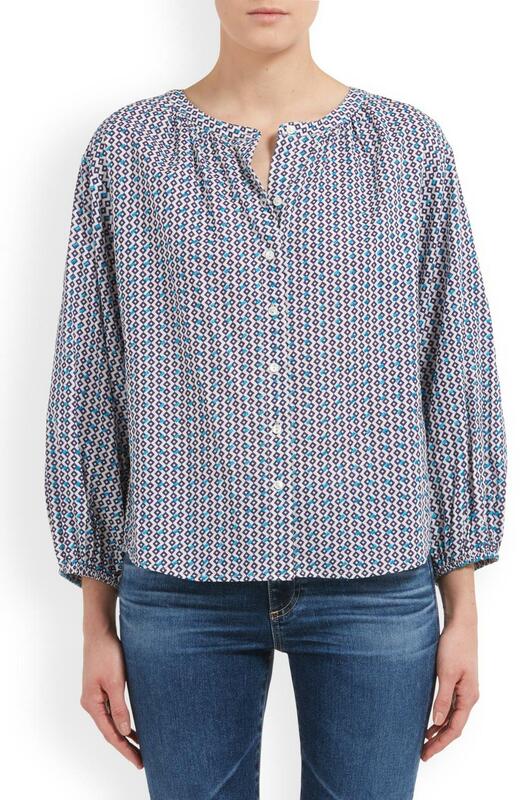 Crafted from a crisp cotton, this button-front blouse features a blue and white print which looks amazing with both blue washes and white denim for summer. With long sleeves and a round neckline we think the Oprah looks great tucked into high waist jeans.